Yesterday was the day that the littlest member of the Happy Little Baker household should have made an appearance! 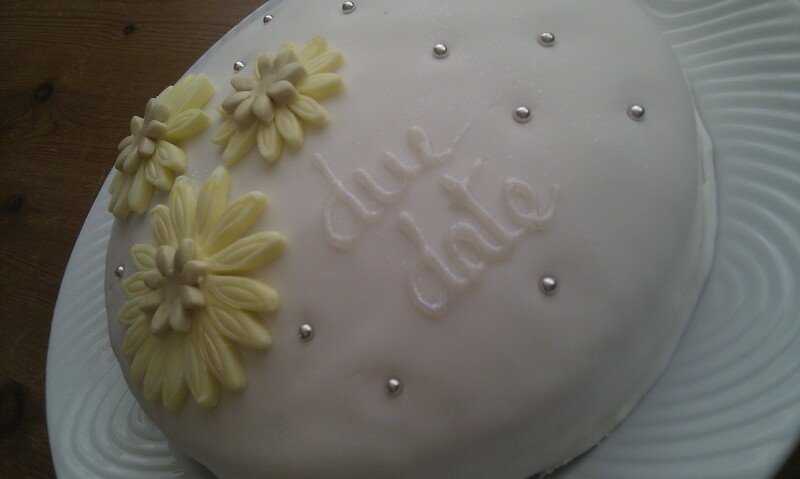 Although only 5% of babies are born on their due date, I decided to keep myself entertained and bake a cake just for me… I call this my due date cake [ta-dah]. It isn’t anything really special but is one of my favourites – a simple vanilla sponge filled with jam and buttercream and decorated in fondant icing. I didn’t spend too long on the decoration as I wanted to just eat it so I kept it pretty simple with my favourite flowers, the Gerbera. I suppose that I should have eaten it all yesterday but even after giving myself a couple of pieces, my husband a slice and also taking my parents some down there is still plenty of cake to keep me going for the next day or two.